Git2Go is the first app which unleashes your full development productivity from everywhere. 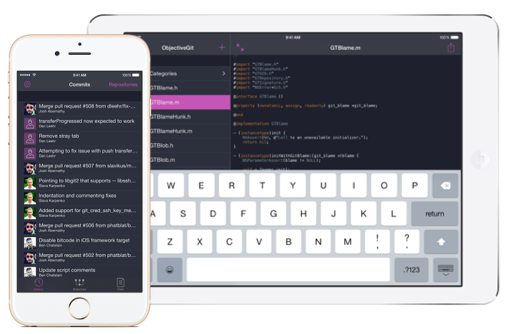 Clone all your GitHub and Bitbucket repositories with just one tap, manage branches and easily commit changes after you’ve edited code on-the-fly — All from your iPhone and iPad! Git2Go focusses on a seamless workflow when accessing your mobile Git environment without adding unnecessary chrome to the development experience. GitHub, GitHub Enterprise, Bitbucket, GitLab and self-hosted GitLab EE + CE are fully supported! While everybody can directly start cloning their public repositories, private ones require the one time Git2Go Private In App-Purchase ($9,99USD / $11,99 CAD / £ 7,99 GBP / 9,99€). If you want to go full enterprise as well, we have a bundled ‘Git2Go Unlimited’ IAP ($14,99USD / $16,99 CAD / £ 10,99 GBP / 14,99€ ready to go for you. Seeing your repos is nice, but the real magic starts when you can start to take immediate actions from your iOS device. We share Apple’s vision of iOS devices being the future of computing. That’s why Git2Go will be a fully compatible Universal App right out of the gate and is already optimized for the upcoming iPad Pro. This way, you’ll easily be able to procrastinate some of the more heavy mobile Git lifting to the slightly larger screen and keyboard. Git2Go is also built to take advantage of Apple’s latest innovations. That’s why it fully supports brand new iOS 9 features like Spotlight search for cloned repositories or Slide Over and Split View. If you’re also rocking a shiny new iPhone 6S or 6S Plus, you can easily preview files from your repositories using 3D Touch aka Peek and Pop. Did you ever saw that fancy hip GitHub repo being posted on Twitter, wondering what it contains and how it is structured? Well, with our brand new Safari extension, you can immediately clone it to Git2Go and view it natively on your iOS device. Tim Herbig is a Product Manager from Hamburg, Germany. He’s currently with XING as a Product Owner for the Premium Membership on Mobile. When not working on side projects or blogging, he’s pretty much into burgers, coffee, podcasts and triathlon. If you have any further questions about Git2Go please don’t hesitate to contact Tim Herbig, Co-Maker of Git2Go — git2go@nerdishbynature.com. We also have a limited number of slots in our TestFlight Beta, so that you can stay up to date regarding our latest features. Building Iridion. Product Person by heart. Don’t serve me bad coffee.